School is out for most of us and summer is in full swing! During this time all I want to do is be outside, and the LAST thing I want is to be slaving away over a hot stove in the kitchen. 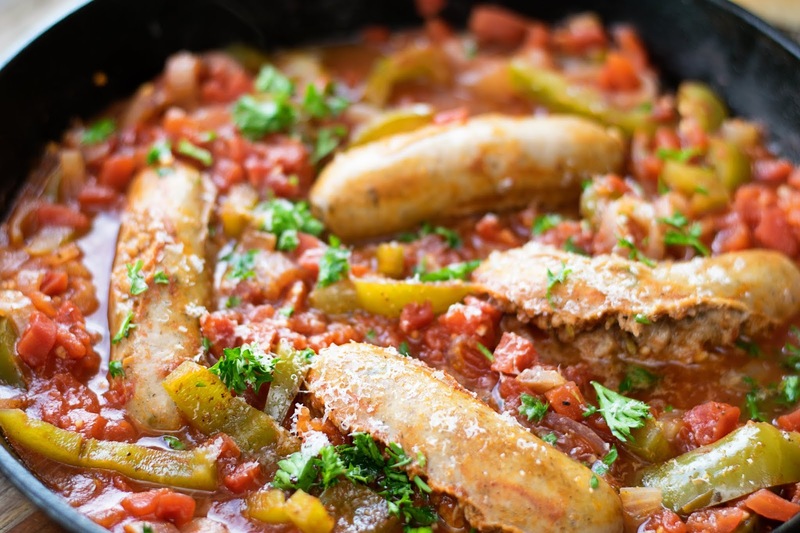 That's why I LOVE meals like this Sausage Peppers and Onions in a Quick Tomato Sauce. To begin you will need to brown your chicken sausages in a HOT pan for 2-3 minutes on each side. Once the sausages are browned remove them from the pan and sit to the side. I like using these chicken sausages because they are a little better for you and health is wealth, right!?! Now to the hot pan you will add the peppers and onions. Sauté for 2-3 minutes, just so that they start to get tender. Now add the garlic to the pan and cook for 1 minute, until you smell it coming up from the pan. Its at this point that I like to add the salt, pepper, and Italian seasoning. The hot pan just wakes up the spices and helps to give you maximum flavor and who isn't about that! Stir everything together and return the sausages to the pan. And there you have it! A GORGEOUS quick and easy weeknight meal that won't have you in a hot kitchen for hours and that the entire family will love! I like to top the pan with a little chopped parsley and grated parmesan cheese and you are ready to eat! I simply cut a sausage into bite-sized pieces and serve over a bed of fluffy rice (that I made in my instant pot while I cooking this), but it's also AMAZING on a hoagie bun as well. 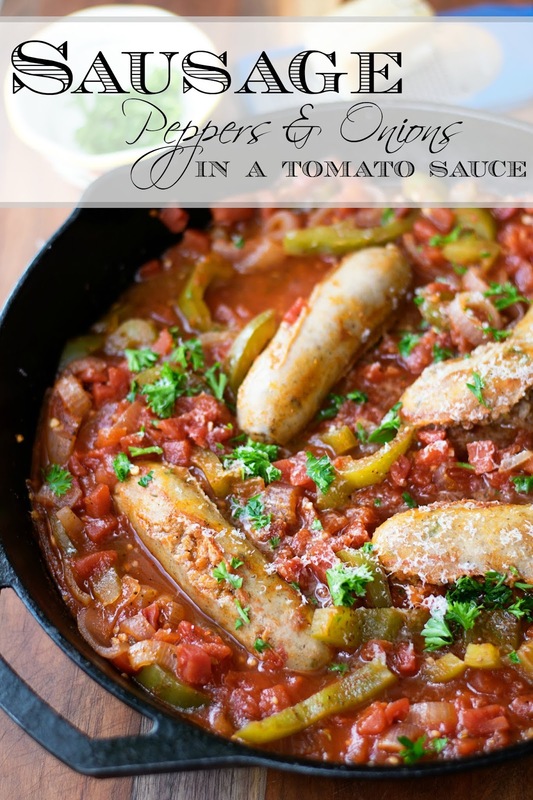 These Sausage Peppers and Onions in a Quick Tomato Sauce is so easy and delicious, and so simple to whip up when you just don't know what else to make. I know you're going to love it so get in the kitchen and give it a try tonight! In a hot pan, brown the chicken sausages on both sides. Remove from the pan and sit to the side. To the hot pan add the peppers and onions. Sauté for 2-3 minutes. Add the garlic to the pan and cook for 1-2 minutes. Add the salt, pepper, and Italian seasoning to the pan and cook for 1 minute. Add the tomatoes and sugar to the pan and stir everything together. 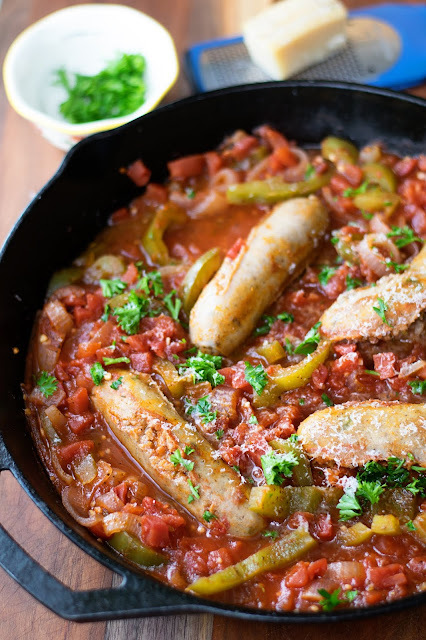 Return the sausages to the pan, cover, and simmer for 10-15 minutes. Top with fresh chopped parsley and fresh grated parmesan cheese. this dish is so similar to something my mom used to make growing up. You're right, so easy and quick and YUMMY!! You've inspired me to make it! Those recipes from our childhood are always the best aren't they!? !